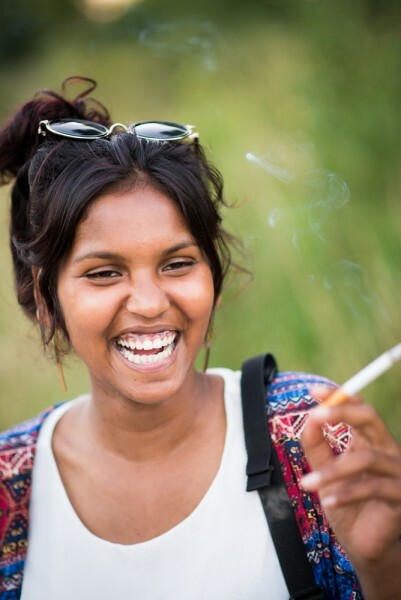 If you’re a smoker, our list of 7 least harmful cigarette brands in India might help you make some much-needed changes to your habit. While there’s really no such thing as a “healthy” cigarette, if you are going to smoke, you may as well try to be a little bit nicer to your body. You can also look at our list of 5 Healthiest, Least Harmful Cigarettes with The Least Chemicals to see what cigarettes are a little less harmful. Or you can just avoid smoking altogether. We don’t understand why some people smoke but we’re pretty sure, they have their reasons. Many different factors influence people to smoke though. It can easily start with peer pressure where you want to look cool and ‘in’ with your circle of friends, which is especially common for teens. Teens are going through a lot of growing and sometimes may not always see the long term effects of the decisions they choose. What we can do is help them understand the harmful effects of smoking. On the other hand, adults who smoke may be dealing with the stresses of life, like problems at work, at home, or a relationship that’s on the rocks. Other reasons may be in connection with controlling their weight, as smoking can suppress the appetite since it affects our sense of taste. These may be temporary pros of smoking but in the long run, smoking can do more harm than good. Cholera, dysentery, smallpox, measles, HIV, and tuberculosis are just a few of the many communicable diseases that have the highest rate of mortality. However, some noncommunicable diseases are on the rise which burdens middle and low-income countries. The after effects of smoking like lung cancer, chronic obstructive pulmonary disease (COPD), cardiovascular disease, along with other disorders is now becoming an epidemic. However, these diseases are preventable and have been exacerbated by smoking. In 2015, COPD was the second highest cause of death in India with 4.3% of deaths. India is among the countries with the highest percentage of the world’s total smokers at 11.2%. Another finding shows that China, the USA, India, and Russia are the countries that record the highest mortality caused by smoking, worldwide, based on the study conducted by the Global Burden of Disease published in The Lancet. There are some countries where the government has had to step into action and impose a smoking ban. Some even practice a total smoking ban in federal buildings, public transport, buildings, and workplaces. There are even risks for nonsmokers if they experience secondhand smoke. Based on the Centers for Disease Control and Prevention, more than 7,000 chemicals floating in tobacco smoke. Therefore, many ask the question, “is secondhand smoke worse than smoking?” For the most part, effects to non-smokers are pretty much the same as they are for those who smoke. There are even recorded lung cancer deaths that were the result of exposure to secondhand smoke. This is also another reason as to why some countries implement a smoke-free law, to protect the health interests of those who do not smoke.Tobacco naturally contains nicotine but as natural as it is, this can still lead to smoking addiction. There are also other additives that make a cigarette even more dangerous to our health. The so-called light or mild cigarettes can be as dangerous as the regular cigarettes, and some even have a higher nicotine and tar content than the regulars. While the U.S. is making their policy stronger in dealing with tobaccos, India is still developing laboratories to check the nicotine and tar levels of their cigarettes, which is also why Indian cigarette brands have no labels on the packs, for their nicotine and tar content. Not all the popular Indian cigarette brands have data for their nicotine and tar content which makes it possible for there to be brands that contain much lower nicotine and tar than the ones on our list. Based on the data we found, these items on our list are among the least harmful. However, a study conducted by the Indian Journal of Research shows that the average nicotine content of bidis (which are homemade, rolled cigarettes that are popular in India) is 26.9 mg which is higher than regular cigarettes at 15 mg. The average nicotine content in filtered cigarettes is 14.5 mg, unfiltered cigarettes is 15.6 mg, and chewing tobacco is 3.4 mg. It is prohibited in India to use the terms “light” and “low-tar”, which is considered to be misleading packaging and labeling. Cigarettes are truly hazardous to our health and many believe that there is no such thing as a “less harmful cigarette brand.” Light cigarettes may be lower in additives, tar, and nicotine, but knowing that tobacco naturally has nicotine, we should be mindful that the nicotine is still higher than what is written on the pack. To create our list of least harmful cigarette brands in India, we relied on help from Quora and our list of 10 Best Selling Cigarette Brands in India where we can find the most popular brands in India. We used KiwiCigs to get the nicotine and tar content. As much as we want to add the popular cigarette brands of ITC, it was quite impossible to look up the nicotine content and tar content of their cigarette brands, which we used in ranking the cigarettes on our list. The nicotine content in Indian cigarettes varies on the brand and the type (regular or lights) as well. If you want to be somewhat safer with your smoking habit, take a look at the least harmful cigarette brands in India.